On 23 and 24 June 1314, Robert the Bruce faced King Edward II at Bannockburn, near Stirling. The Scots army was outnumbered almost three to one. Edward had more than 2000 battle-hardened knights to Bruce’s 500 horsemen. A mere 6000 Scots foot soldiers faced Edward’s force of 16,000 infantry. The Scots carefully chose their ground at Bannockburn. They used the natural terrain to counter the threat of Edward’s heavy cavalry and dug small pit traps or ‘pots’ to defend their flanks and force the English to fight them head on. The first day of the battle was a Sunday and the Scots heard Mass before they took up arms. The Scots formed three massive schiltrons and held their ground at New Park. Bruce was mounted on a small horse - a ‘palfrey’ - and was armed with only a battleaxe. An English knight, Henry de Bohun, saw the Scots king and turned his war-horse to charge. 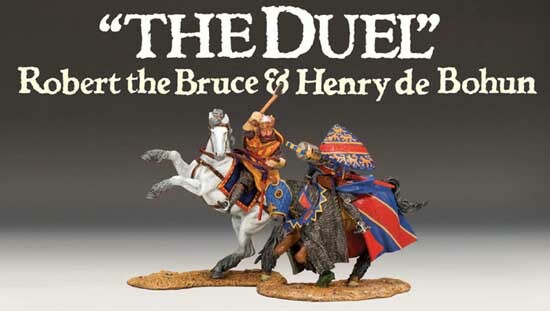 De Bohun thundered across the field levelling his lance at Bruce. The Bruce stood his ground and waited till the English knight was almost upon him then stood up in his stirrups and brought his battleaxe crashing down on Henry, splitting his helm and his skull in two. The next morning the Scots rose and prepared for battle. It was Midsummer Day, the Feast of St John the Baptist. The English had a dreadful night and morale was low. Disastrously, Edward ordered his men to cross the river to the east of New Park. The Scots knelt in prayer as Edward’s army tried to negotiate the boggy ground. The schiltrons formed and the Scots spearmen took their toll of the English cavalry. Bruce ordered the Scots to push forward and a forest of spears sent Edward’s army crashing back upon itself. At the Scots cry of ‘Lay on! Lay on! They fail!’ Bruce’s camp followers - the small folk of the baggage train - took up arms and charged to join the battle. The English took this as a new Scots force and panicked. The weight of numbers of the massed ranks of English knights, infantry and Welsh longbow men proved fatal as mounted knights struggled to escape back across the river and fallen men were trampled underfoot. The Scots pushed Edward’s army back to the steep-sided Bannockburn until the river was filled with bodies.